The sandwich, cerveza and surf institution known as Board & Brew in Del Mar, California is opening a second location in Carlsbad in May. It's true and you heard it here on Qmania first. People talk about these sandwiches like they cure cancer. They may very well get deep into the marrow and heal your soul. We wouldn't know. We've never been! We're almost too ashamed to admit that. The folks of "North County" (what locals call Northern San Diego County) are in for a treat. The 2nd Board & Brew is to open in Carlsbad in May of 2009. We can't imagine how popular this place is going to be. As popular as Shady Grove in Austin? As popular as the Wiener Circle in Chicago? Pink's hotdogs for tourists in LA? Probably 10 times all of them combined, based on the reviews people are writing about the original location on Yelp. These people are zealots! Yikes! This is what we like to call "cult dining"...with a sun tan. 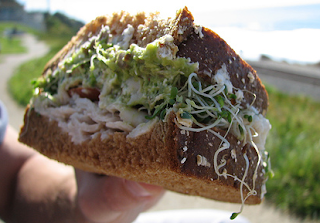 We feel the peer pressure to take a special trip out there just to try the Turkado sandwich people keep raving about. But then we'd have to compete with the starving surfers and students at Carlsbad High, MiraCosta College and all of the other schools in the area. If we have any say in things they'll have a great deal on Qmania! Stay tuned and well fed. I hope this one is as cool as the Del Mar location.